Charlie Moore Place is south of the Blue Range Primitive Area. It is in Arizona, but just barely. 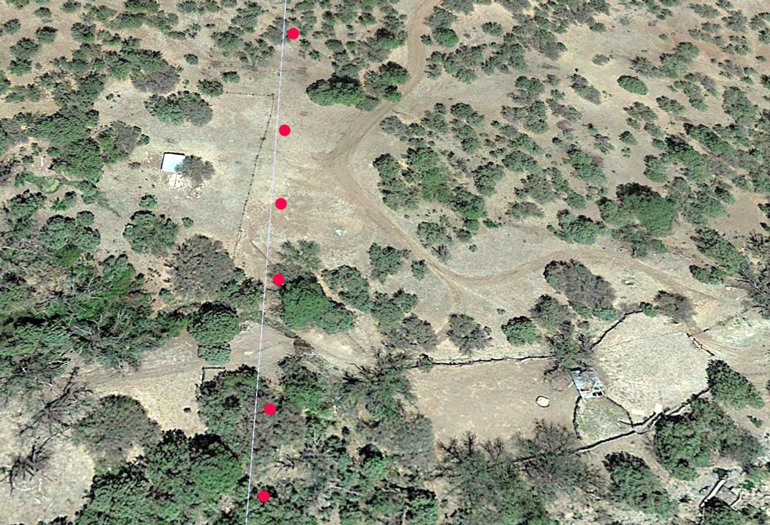 A Google Earth "Flyover" of the area today shows the outlines of several corrals and the roof of a building. The white line is the Arizona/New Mexico border. 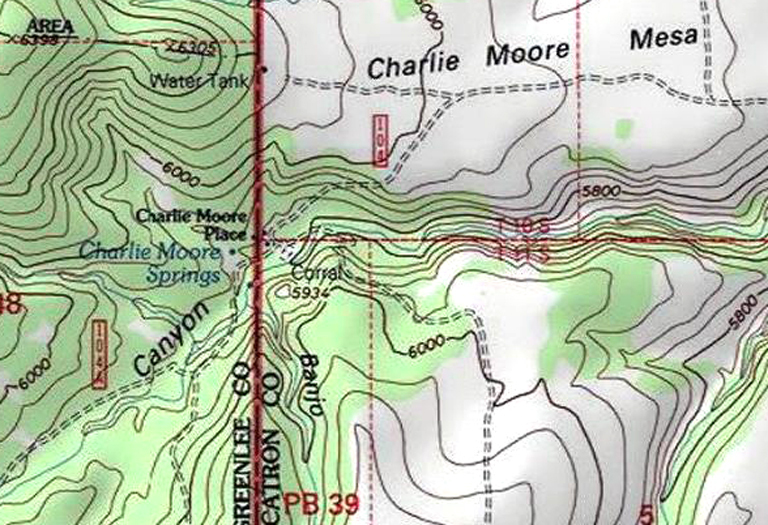 The author of the Grand Enchantment Trail Guides wrote: "that this mountain(Charlie Moore Mountain) is named for a pioneer-era rancher who lived nearby, at "Charlie Moore Place" as shown on maps. 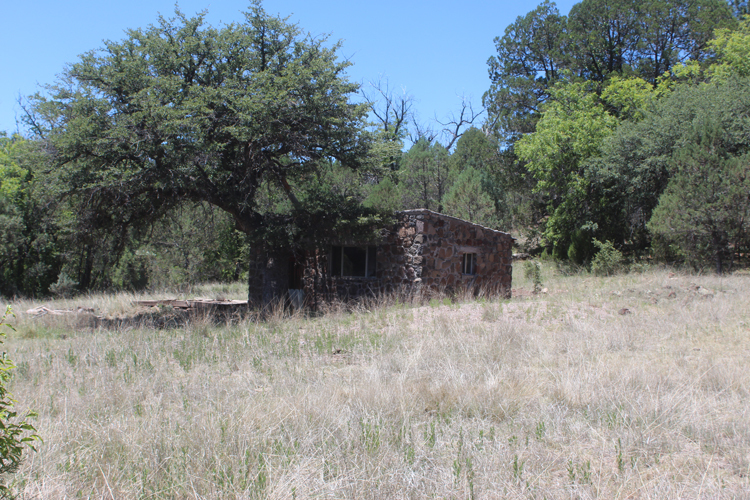 One story has it that the ranch, located at a favorable crossing point of the Blue Range, was a popular stop along the horse rustling routes, with Charlie accepting bribes from the outlaws in exchange for his silence whenever the sheriff's posse came calling". A different version of this story has it that it was cattle that were being rustled and moved through Charlie Moore's Place. Most of those were supposed to have come off the nearby WS range. Butch Cassidy and the Wild Bunch crew, as employees of the WS Ranch, shut Charlie Moore down. They could not have a ranch that they worked for sustain such losses and they did not want the law poking around in the area. After the Wild Bunch left the area, Charlie is supposed to have gone back into business taking care of the riders of the "Outlaw Trail". This is a current view northward across Sunflower Mesa, southeast of Charlie Moore Place. In 1882, James Henry Cook came to the San Francisco River Valley to help an English friend establish the WS Ranch. Sunflower Mesa would become one of the sections of land grazed by the cattle of the WS operation. There are no roads to Charlie Moore Place that originate in Arizona. 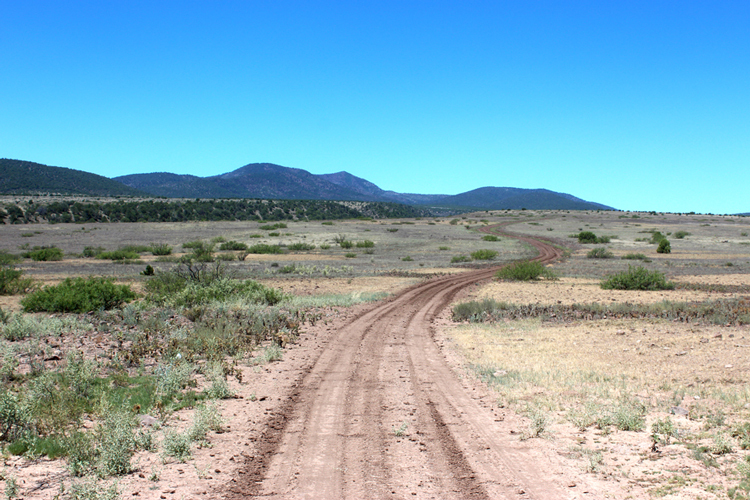 Vehicular travel to the site must be accomplished from New Mexico. The Sunflower Mesa road can be used as one leg in the trip to Charlie Moore's Place. It, however, does not have an all weather surface. I got lucky and caught it between monsoon storms. This road may be a challenge to drive when it is wet. After a 10 mile ride on the Sunflower Mesa Road, a gate in the fence marking the Arizona/New Mexico border allowed me to cross and I turned to the northwest on an obscure track. That section of road towards Charlie Moore Place was rough and 4 wheel drive was required. One of my skid plates was banged pretty hard while traversing a rocky section of the trail. 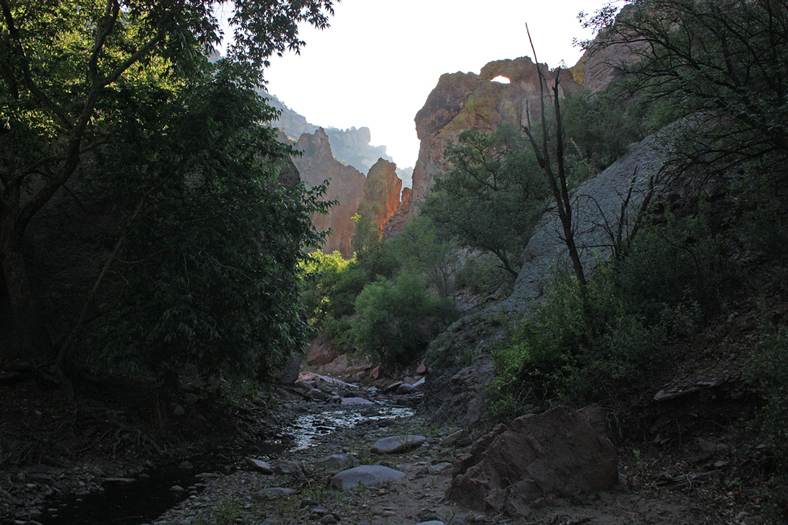 After the wash crossing, in the bottom of Beaver Canyon, the road entered a corral and passed by Charlie Moore Spring which had filled two metal tanks to overflowing. 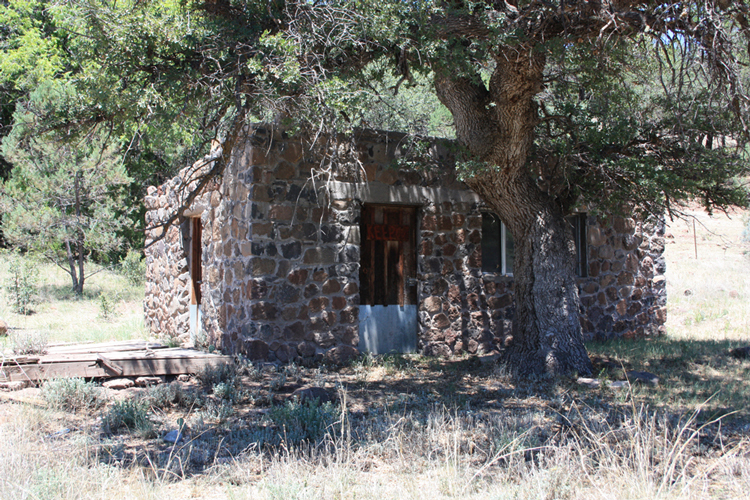 In a clearing above the corral was this stone building standing in the shade of a large oak tree. This is Charlie Moore Place. The cabin is very substantial. It was constructed from volcanic boulders that were mortared together with cement. The door and window lintels are concrete. Unfortunately, it is not the Charlie Moore Place from the "pioneer era". I was told that the stone cabin is a replacement for the first Charlie Moore Place. 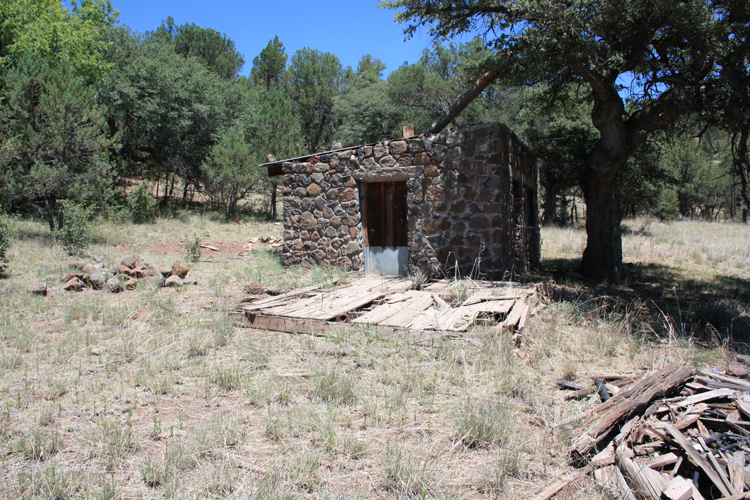 Apparently, all that remains of the original building, is the wooden floor that is next to the stone cabin. 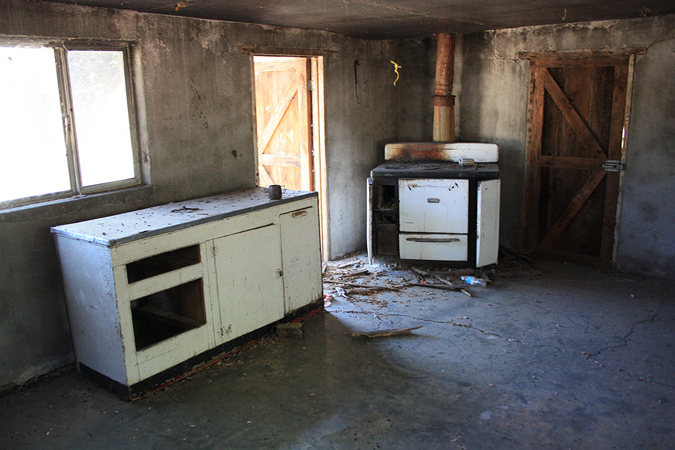 The wood stove, inside, is a modern era(1950's?) Kenmore. 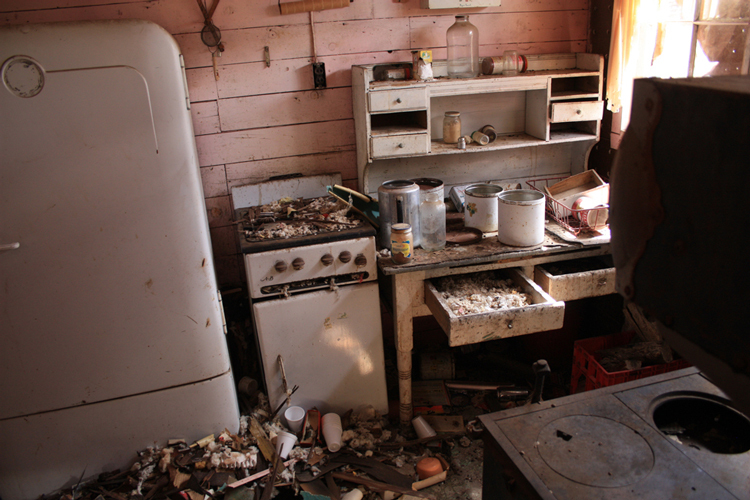 It would need to have a packrat's nest removed before it could be fired up. With a minimal amount of effort this place could be made inhabitable. The slab floor has probably helped to maintain the cabin's integrity. 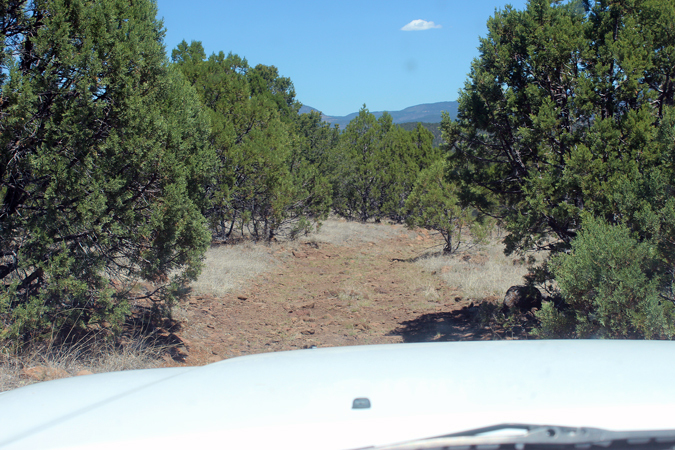 This is the view down onto the cabin at Charlie Moore Place from the road out to Charlie Moore Mesa. The horse trail near Charlie Moore Place passes through the hills in the background. To the north, the terrain is much more rugged. The Charlie Moore Mesa road was in better condition than the roads that I had used to access the area. Around 1887, a WS Ranch employee, William French was promoted to ranch manager. He remained in that position until 1899. In 1928, Mr. French published his book "Recollections Of A Western Ranchman 1880-1899". As in James Henry Cook's book, Charlie Moore was one of the few members of the WS crew identified by name. Mr. French often spoke of him as "Old Charlie". My impression was that the nickname was a sign of respect and affection. Mr. French was very detailed in his recollections of events that occurred on and around the WS Ranch. One incident that took place in 1884, was described by French. Later known as the Frisco War, this violent event involved a lengthy gun battle near Reserve New Mexico. On the one side, were many cowboys, including French, Charlie Moore, and other WS crew members. On the other side was a single man, Elfego Baco. The cowboys would later claim that they were trying to apprehend a man who had unfairly targeted and injured one of their group. Baca would insist that he was trying to arrest a person who had committed criminal acts. Even though, hundreds, if not thousands, of bullets were fired into the hut where Baca had taken cover, he survived. After many hours, Baca surrendered, and was taken into custody. At trial, he was found "not guilty" of charges.....This incident would launch Elfego Baca's reputation as a "superhero" in New Mexico history. The other instances in which Charlie Moore's name came up in the French book were ones that would be associated with normal ranch life. As in the book written by James Henry Cook, William French did not mention any association with places away from the WS Ranch. The small cemetery, enclosed by a fence, is situated on a short, but steep, hillside. There are four headstones marking the gravesites. One of the graves is common to four persons. Each of the 7 persons buried here suffered a violent death. This is the gravestone marker for Charley Moore. His death was the first to occur after French had become the ranch manager. French wrote: "It came with a suddenness that was entirely unexpected, and the thought of it even now, nearly forty years afterwards, gives me quite a shock". According to Mr. French, Charlie was well-liked, and his funeral was well-attended. In both of the books written by the WS Ranch managers, Mr. Moore's first name was spelled as "Charlie". The word Lovney should read "Cooney". 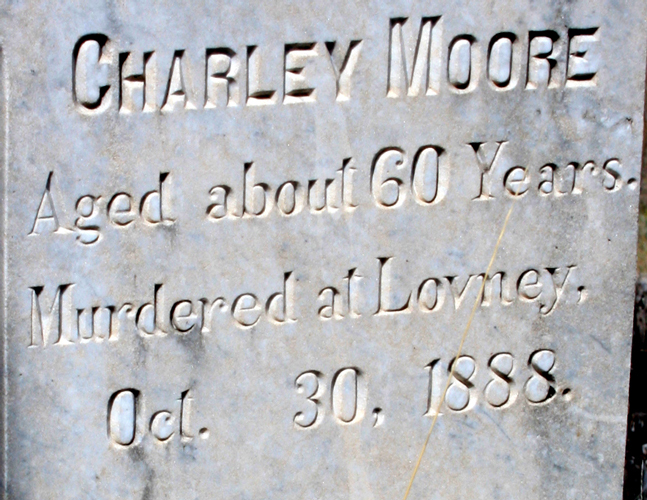 The story that Mr. Moore was involved with Butch Cassidy and the Wild Bunch may be disproved by the date of Charlie Moore's Death. I do not believe that the Wild Bunch was associated with the WS Ranch until the mid 1890's. That was several years after Moore's murder. According to Mr. French, Charlie was shot and killed after an encounter with a saloon owner in the mine camp of Cooney, a few miles east of Alma. Charlie had traveled to Cooney to show support for a friend who had been beaten up by the saloon owner a few days earlier. The saloon owner was a man by the name of Penny. Mr. French wrote that if Penny had known that Charlie Moore was a friend of the man that he had assaulted, that the incident probably would not have happened. Mr. French's words were: "At the time they had no idea he had any connexion with Old Charlie, for Charlie was not a man to be trifled with". According to witnesses, the dispute seemed to have been settled after Charlie's meeting with the saloon owner. In the next instant, however, Charlie had been shot dead. William French was instrumental in bringing Penny to trial, but a "not guilty" verdict was rendered. The judge had no choice but to let the man go. Mr. French found this process to be very frustrating and vowed that he would never seek justice in a court again. The ranch manager was appointed the administrator of Mr. Moore's estate. His duty was to dispose of Charlie Moore's property. There were a couple of horses, a saddle and other tack. There was also a pistol, scabbard and belt. Mr. French offered to purchase those items. There was no mention of a cabin or a place that was owned or used by Charlie Moore. 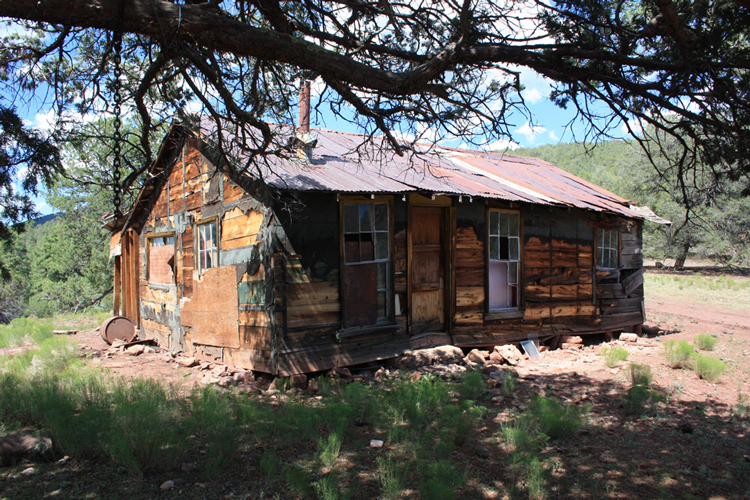 It seems that through the years, that Mr. Moore had provided financial support to many different prospectors. 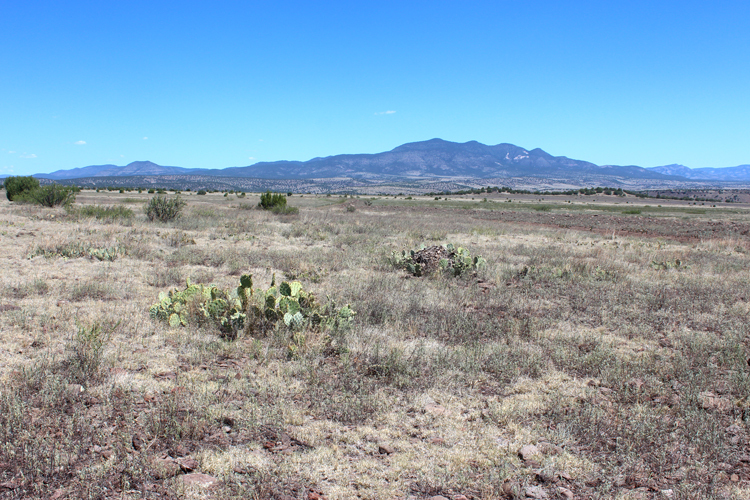 Mr. French wrote: "Old Charlie had a mania for investing his money in mining property, and must have had a prospect in every mining camp in Socorro and Grand Counties, not to mention the adjoining counties of Graham and Apache in Arizona". As the administrator of Charlie Moore's estate, French reported that "All efforts to discover any relatives of poor old Charlie's had proved useless. No one knew where he had originated, and from his own statements, he had lived in every frontier State in the Union". Mr. French noted that "Charlie's claims afterwards turned out valuable". 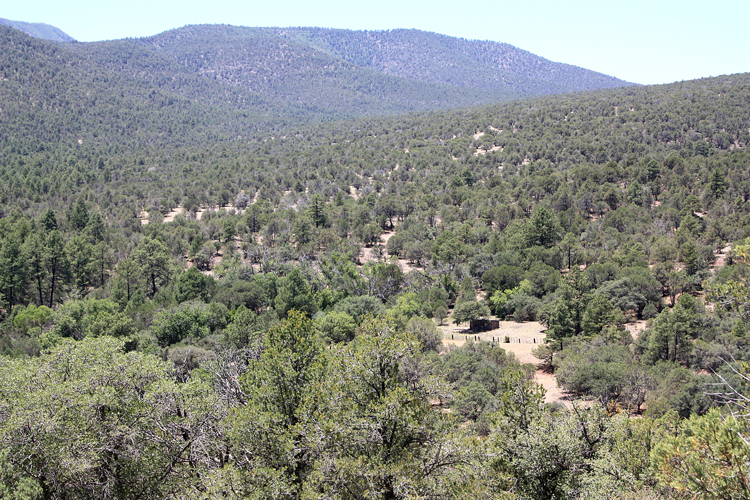 Some were developed into a major mine at Mogollon. Others were obtained by Phelps Dodge at Morenci. The relationship of Charlie Moore to Charlie Moore Place is still not clear to me. 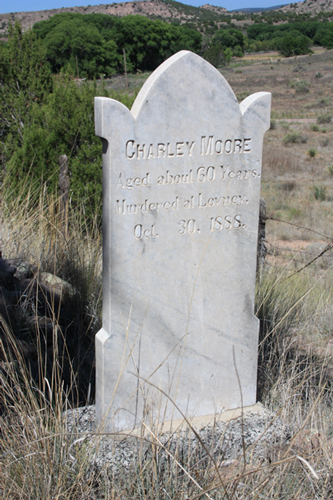 I have been told by a person in the Alma area that the Charlie Moore in the WS Ranch cemetery is the Charlie Moore of Charlie Moore Place. So when was he at the place? Was his time there and his time at the WS Ranch separate chapters or did he split his time between the two? A Google search for "WS Ranch" produced this photo. 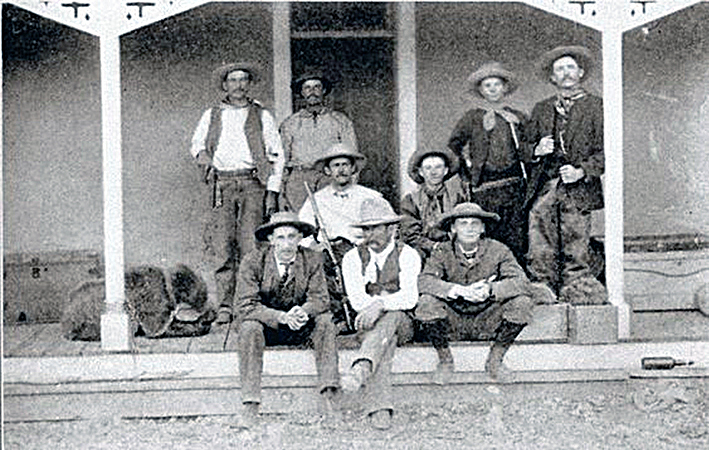 The caption is: "WS Ranch cowboys on the porch of their bunkhouse in 1882". Charlie Moore was an older fellow in the 1880's. I wonder if he is in the photo.....could he be in the front row, center position? 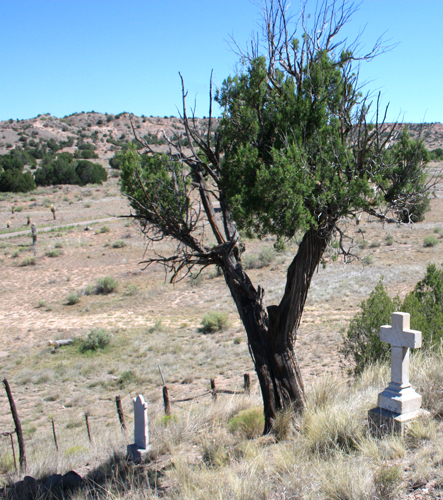 Who are the other persons interred in the WS Ranch Cemetery? 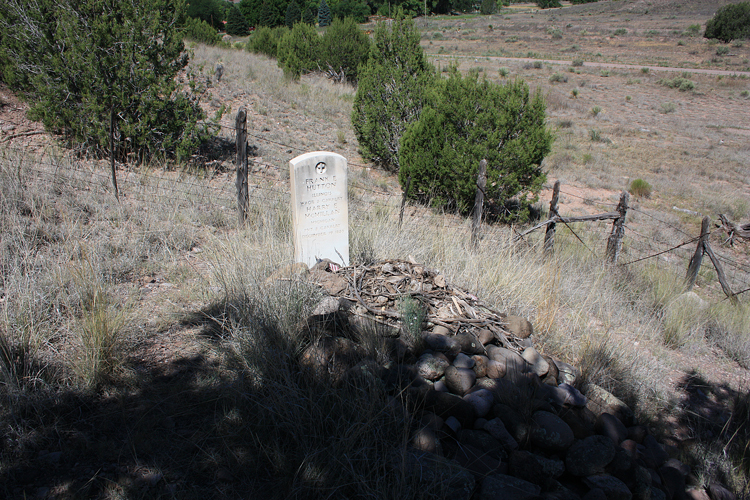 This is the grave of the first person to be buried in the WS Ranch cemetery. Edward Lyon, a person who had been visiting a neighboring ranch, was ambushed by Apaches in 1885. When he did not arrive back at the ranch after a visit to town, a search party was sent out the next day and his body was found. Evidence at the scene indicated that he had been riding along the trail reading a letter from home when he was attacked. James Henry Cook was the manager of the WS Ranch at the time of this incident. 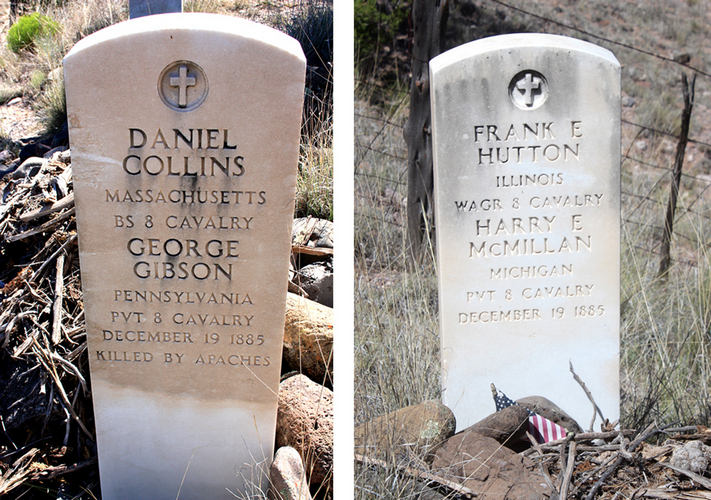 Later in 1885, a calvary unit was ambushed by Apaches while on patrol south of Pleasanton New Mexico. There were 5 casualities. Since it was common for men to enlist in the Army under assumed names, the unit officers thought that the families of four of the soldiers would probably not be able to be located. 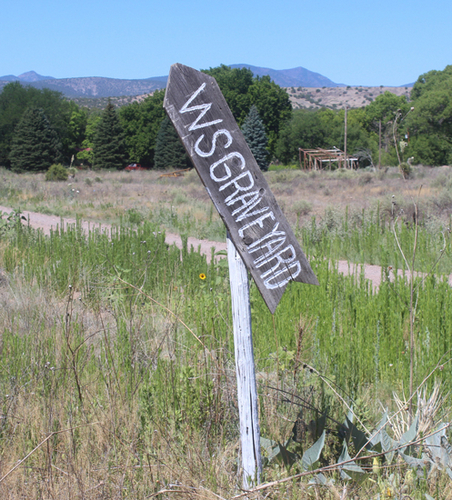 The WS ranch manager was asked if they could be buried at the ranch cemetery. 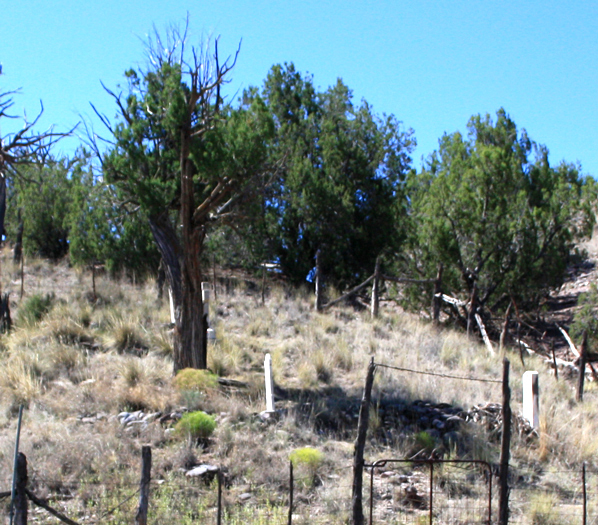 The four men were buried in simple pine boxes as a group together in one site. The grave is marked with a single stone marker. Both sides of the headstone are engraved. A grave was dug for an Army Surgeon who was also killed in the ambush. The burial of Dr. Maddox was temporary. His family soon moved him to a permanent site elsewhere. Mr. French wrote in his book that one of the factors that determined the placement of the soldiers' grave was that it was in the shade of a large tree for most of the day. His words were: "having selected a suitable site in our little graveyard under a spreading cedar, which the sun reached only in the late afternoon, we prepared to dig the graves". Could this be that same tree? If it is, it has done its job long and well! 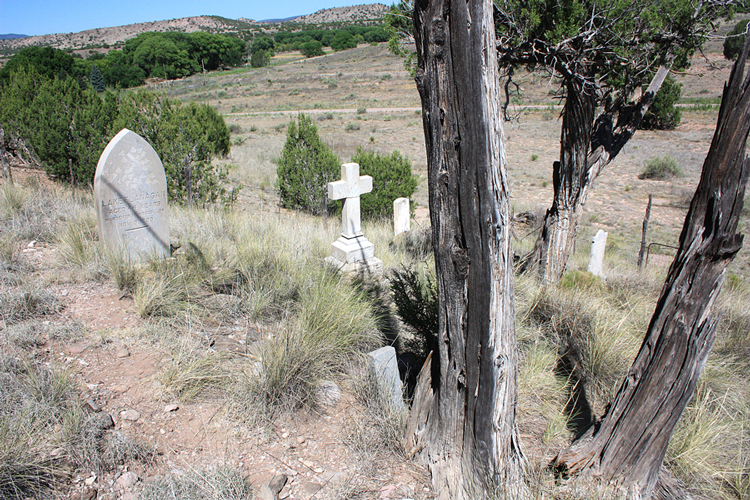 The last person to be buried in the ranch cemetery was Luke Flanagan, foreman at the WS Ranch. He was shot in Mogollon. This event, according to Mr. French, was another controversial incident. Contrary to his thoughts of the judicial system, after the trial of Charlie Moore's killer, Mr. French became involved in the trial of the murderer of Luke Flanagan. Unfortunately, just as had happened in the Charlie Moore trial, the perpetrator was found to be not guilty. I wonder how common it was for typographical errors to occur on grave markers? In this case, both "Lake" and "Moggollon" were mistakes in spelling. I have provided only the most basic of summaries for the stories associated with the WS Ranch Cemetery. For more information, Mr. French's book should be sought out. There are references online to the times and events associated with the WS Ranch. The visit to the Charlie Moore Place and the WS Ranch Cemetery had occupied quite a bit of my first day out along the border. To conclude the day, I drove northeast out of Alma towards the site of Claremont, another old mining camp. 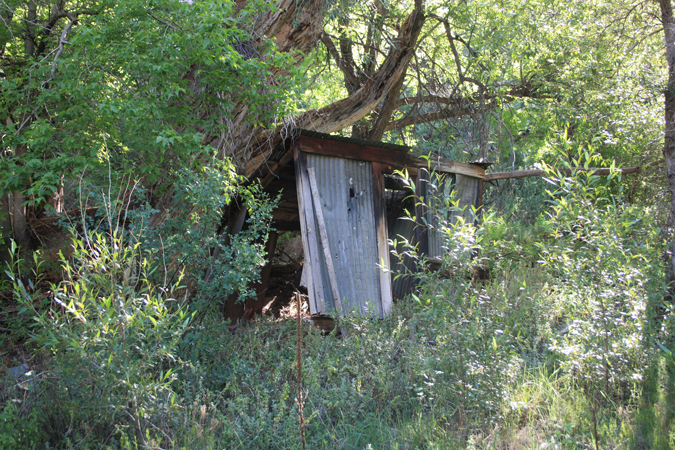 Claremont was very severely posted against any entry, but nearby was this interesting cabin. Although well stocked, the cabin has not receivd much care. Whenever I travel alone, I usually do so in a pretty minimalistic fashion. This was the extent of my camp located on a spur off the Claremont road. 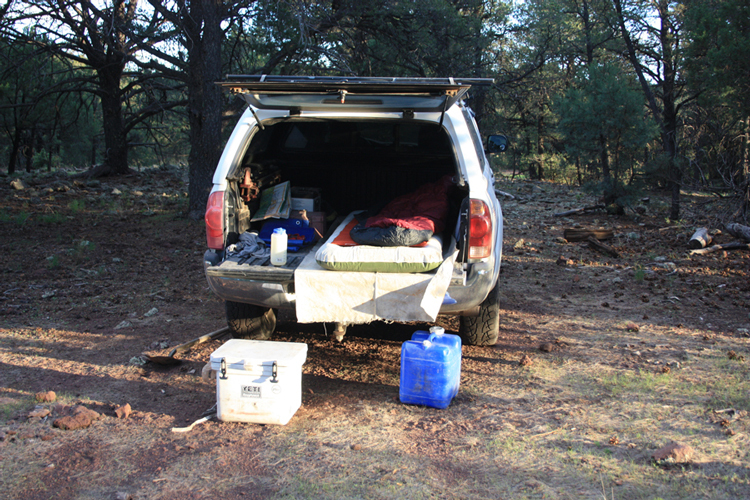 Just after sunrise the next morning I was parked 4 miles east of Alma at the FS201 trailhead on Mineral Creek. The goal was to walk a couple of miles up Cooney Canyon to look over the area of the Cooney townsite and the Cooney Mine. 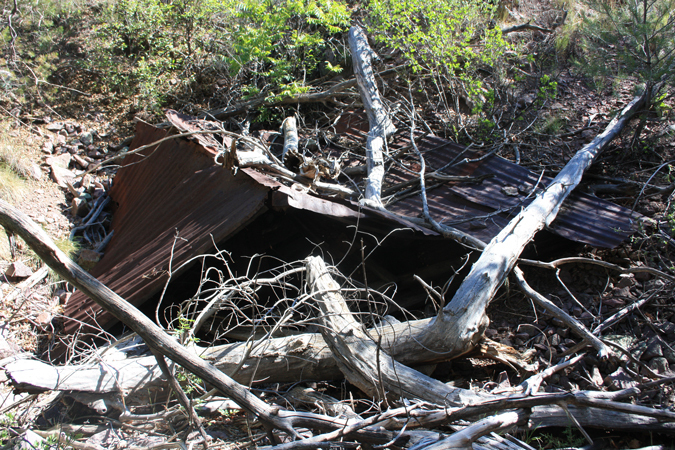 The Cooney Mine Camp had been the location where Charlie Moore had been murdered. On the drive in to the trailhead, I had passed the tomb of Sergeant James Cooney at the Cooney Cemetery. 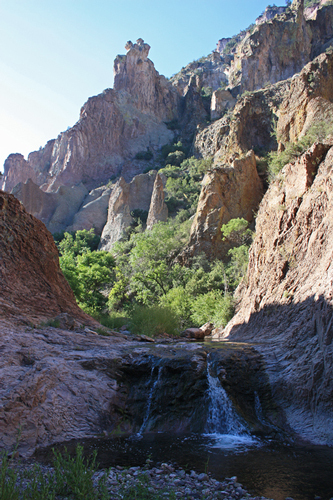 Mr. Cooney, while working as a cavalary scout had found silver ore in Cooney Canyon in 1870. He had kept that information secret and after his discharge in 1876 returned to the area and began to work the ore deposit. He was killed by Apaches in 1880. 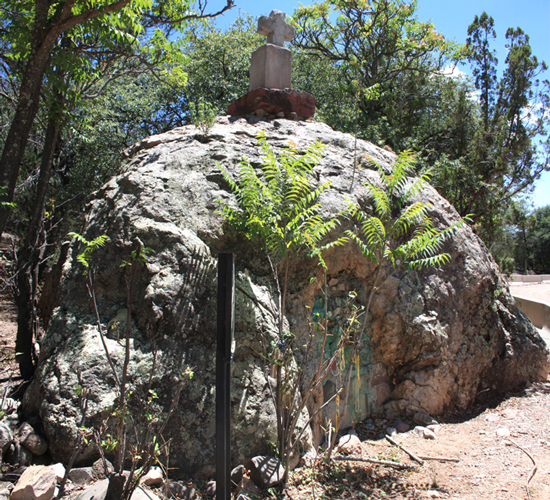 His brother had the interior of this large boulder hollowed out, and James Cooney was interred inside. 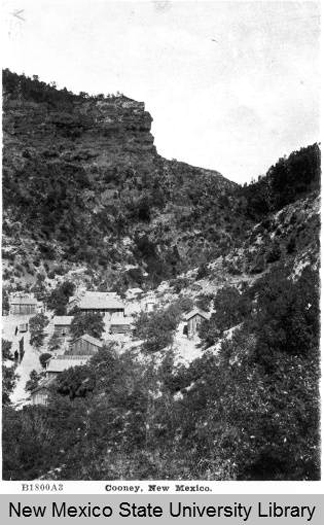 According to the "Place Names of New Mexico": "Although Cooney the prospector was gone, the mining camp named for him on Mineral Creek(the locality earlier had been called Canyon City) thrived and by 1899 Cooney had 600 residents, three stamp mills, a school, a church, and two hotels. 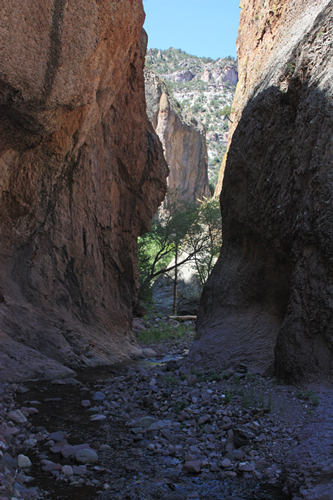 But in 1911 a flood destroyed much of the town....."
Cooney Canyon is a spectacular canyon. The lower portion of the drainage is narrow with sheer walls. There is not a developed trail. The road to Cooney is long gone. The route is usually up along the stream bed. Cairns used to mark the way are common. I think that the natural arch is called "The Eagle's Eye". The pinnacle to the right in this photo is called "The Needle". 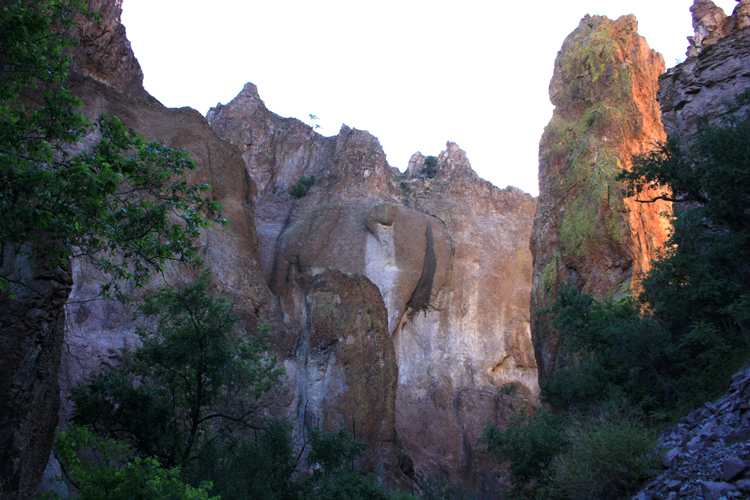 The rock materials, in the walls of the canyon, are primarily volcanic in nature. 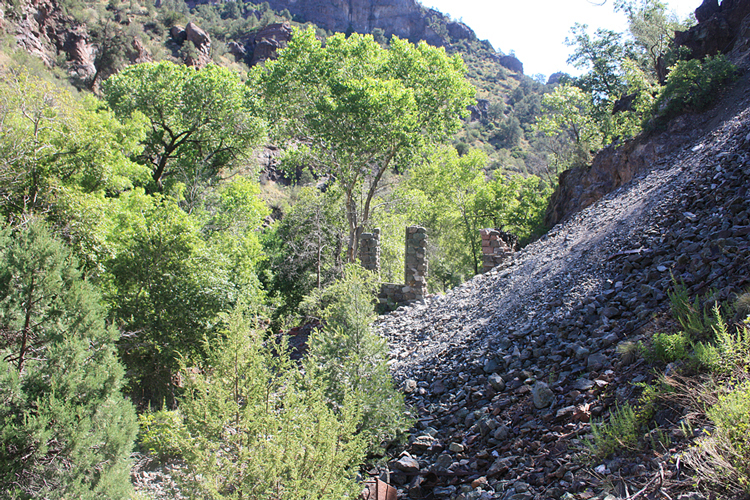 At one time there was a road up through Cooney Canyon. At rocky ledges in the stream bed, metal rods can be seen that were driven into the rock to support the road. 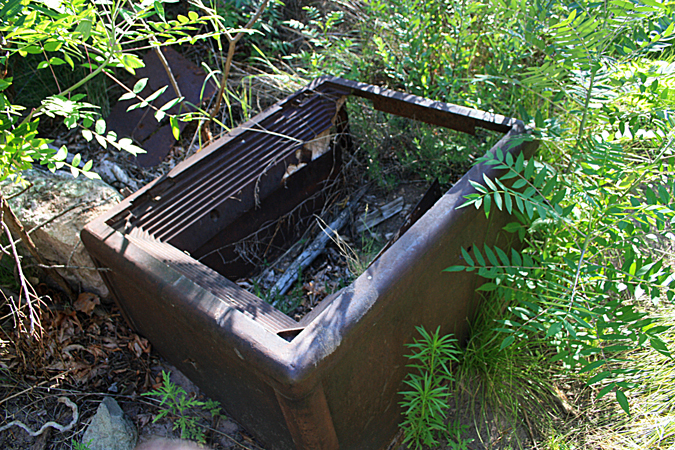 This old safe was spotted along the trail. The areas around the door hinges are damaged. I have no idea what the story is. In a mile or so, as the canyon began to open up a bit, rock foundations and the remnants of old wooden structures appeared. 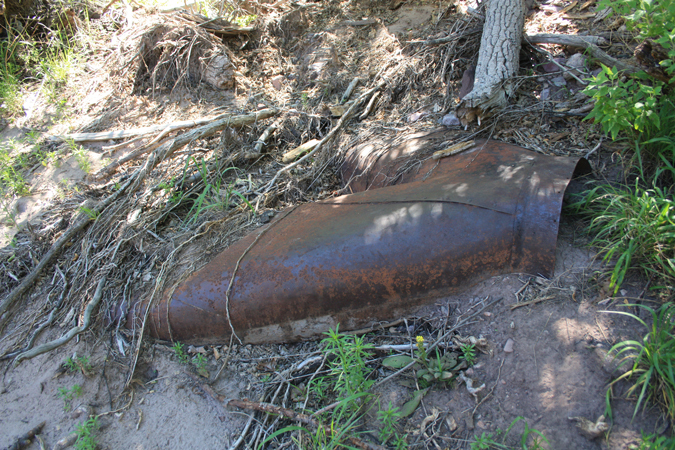 Was this one end of the Cooney Mine Camp? 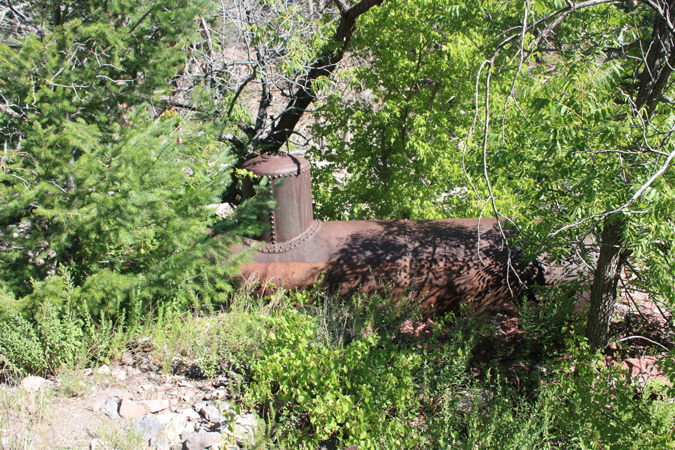 Here and there were a few old mine relics. 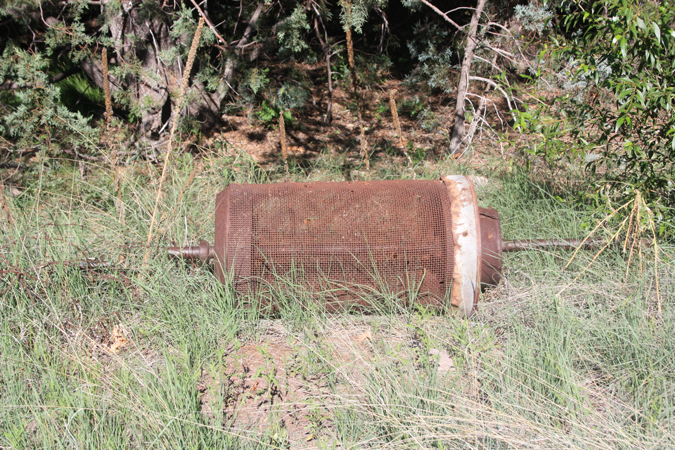 It is my understanding that a lot of the old equipment and materials were stripped from this area and taken to Mogollon a few miles away. 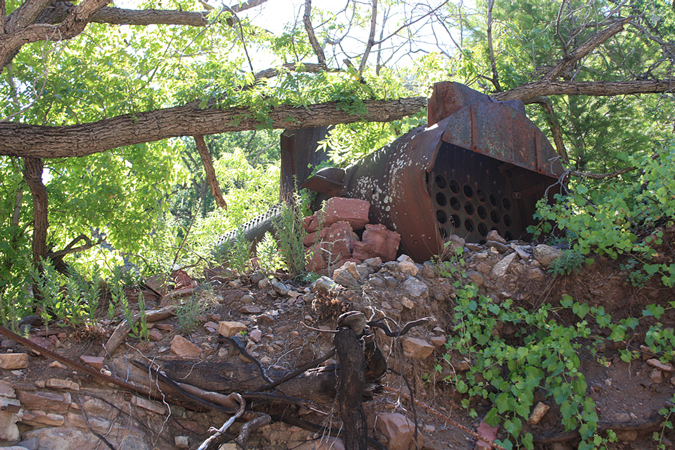 Approximately two miles up from the trailhead, this old boiler can be seen. It is at the site of the old Cooney Mine. Summer time may not be the best time to visit the canyon if one is interested in ruins and relics. The trees, bushes, and vines make the viewing somewhat challenging. 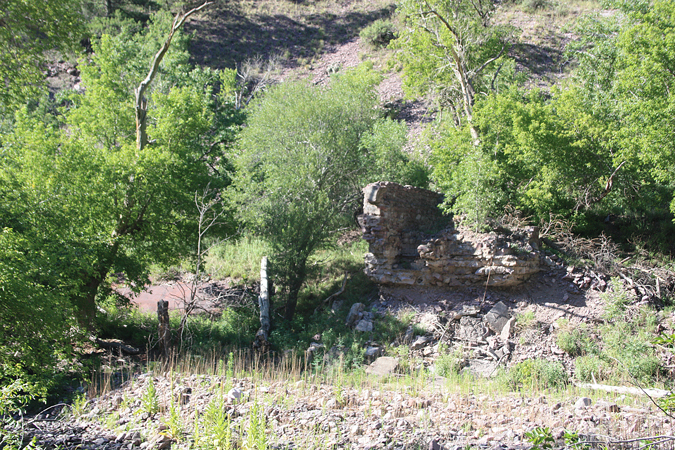 These rockwalls and the dump are associated with the Cooney Mine. 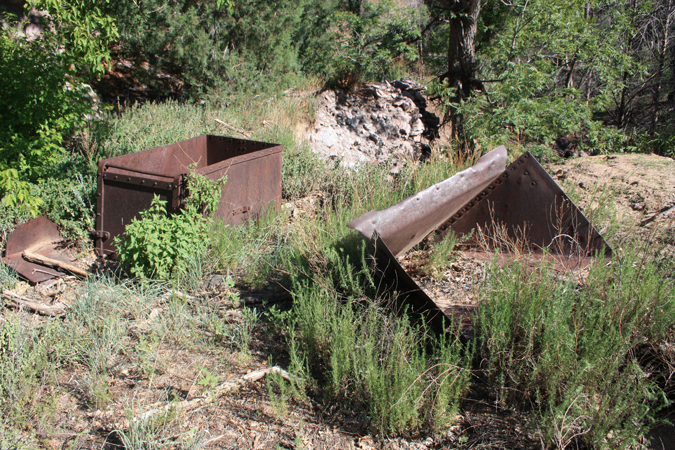 The mine worked intermittently through the early 1900's, and is credited with producing $1.7 million dollars in silver and copper ore.
From what remains today in Cooney Canyon, it is difficult to imagine the development and activity that once occurred here. I came across this photo of Cooney after I returned home. I would like to return one day and locate this view. 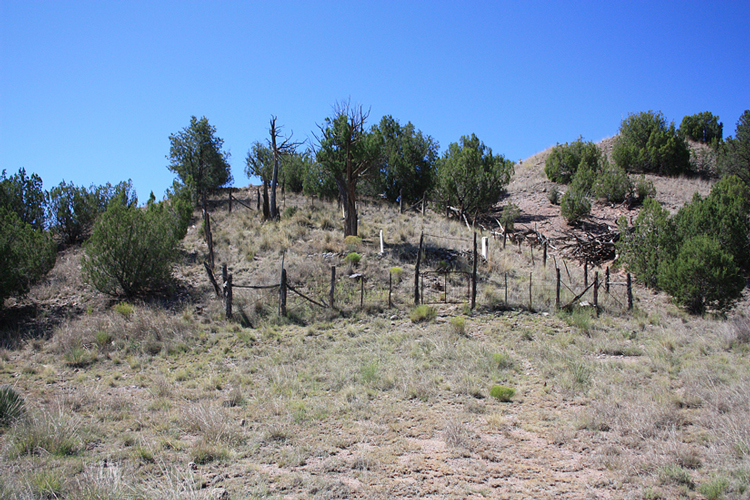 My original objective had been to check out Charlie Moore Place, but as I dug for information, I found that I wanted to visit the WS Ranch cemetery and the site of the Cooney Mine Camp. The travel to those three sites combined for a great backcountry experience!